Written by guest blogger Maya Rodgers. Obesity is one of the leading causes to diabetes and other health related issues. Not enough attention is focused on family pets and their weight. Harmful diseases are at higher risk when your pet is overweight. So next time you go to burn some calories bring along your pet! Not only will you be helping out your pet, but a partner of the furry family is a great addition to your workout. Whether it’s with your dog or your cat, there are some workouts that give you the results you’re looking for as well as giving your new exercise buddy a chance to enjoy their time outdoors. Simple activities such as taking a dip in the pool on a hot summer day can lead to happiness. Seriously, it’s that easy sometimes. Give your canine the same taste of happiness by sharing this activity with them. Many of the muscles in your body are at work when you swim. Besides burning calories and offering a great workout for your dog, swimming is particularly beneficial to animals with joint pain or arthritis. Next time you’re poolside be sure your pet is there with you. Not only is physical exercise beneficial to your canine and feline friends, strengthening your pet’s mind is important as well. Food puzzles are a great way to occupy your hyper pet as they try to retrieve food from the toy. Puzzle toys help to stimulate pets’ brains. During the act of solving the puzzle, cats and dogs will improve dexterity and build their coordination. Another exercise that can work with both cats and dogs is completing sit-ups with a laser pointer or small flashlight in your hand. The constant and random movement of the light will capture your dog or cat’s attention. They energy that they exert in pursuit of the light will serve as their workout. Jogging with your pet is a great way to stay healthy. This workout will build endurance, burn calories, and strengthen muscles--plus your dog gets a chance to release all that pent up energy. Take a jog around your neighborhood. If your neighborhood isn’t exactly pedestrian friendly, try your local park. Be sure to check into your park’s rules concerning pets and off-leash areas. If you live in a home with an ample sized backyard, take your dog off its leash and throw a Frisbee around. Lots of running, throwing and chasing is guaranteed to happen. Your dog will appreciate the time away from the leash. 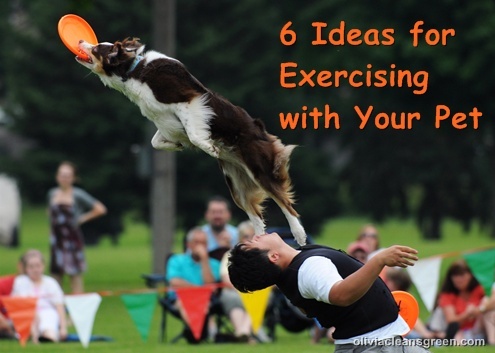 Challenge your dog by throwing the Frisbee up high. Watch as your dog amazes you with the height it clears. This exercise is tailored for your cat. Did you know that lifting weights can serve as a method of toning your muscles as well as keeping your cat active? Tie a toy on a string around one of your dumbbells and allow it to dangle. As you do arm curls the toy will catch the attention of your cat and keep them busy. Grab your new workout buddy and try out these exercises. They’ll make you and your pet feel so much better in the end. Exercise helps to improve your overall health. That means you and your pet will look forward to seeing lots of each other for years to come. Guest blogger Maya Rodgers is the mother of two children and always on the hunt for new ways to make the small things in her daily life more environmentally friendly. Her hobbies are diy projects, spending time with her family, and writing. She enjoys writing on her Pets and Pests blog in order to inform others on the tools she has learned as a pest control consultant at Terminix.